If you’re a book lover in the UK (or maybe not in the UK!) then you’ve probably heard of the Costa Book Awards. 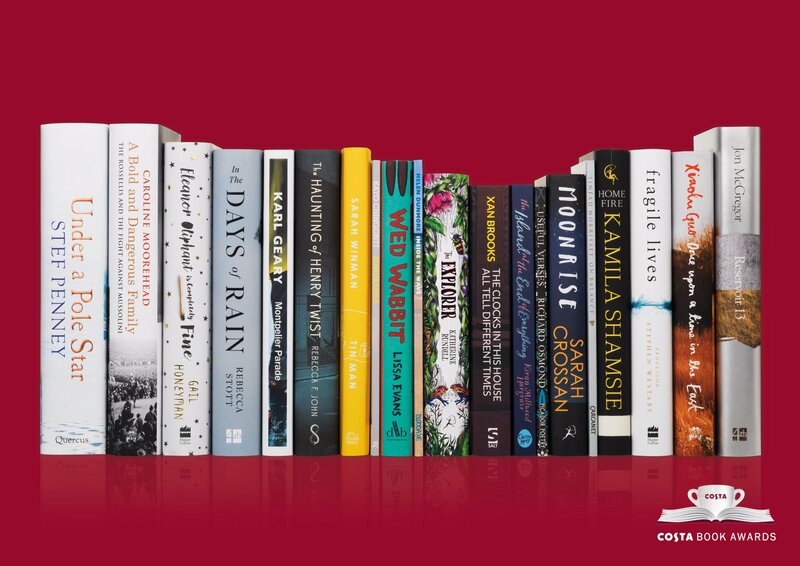 Over more than four and a half decades, the Costa Book Awards have become one of the UK’s most prestigious book prizes, second only to the ManBooker Prize, having featured such prestigious authors such as Philip Pullman. One of the things that makes the Costa Book Awards as popular as they are is the fact that the shortlisted books have such a wide appeal, and don’t alienate any one group of people. The awards celebrate authors living in the UK and Ireland through five categories: First Novel, Novel, Children’s Book, Biography and Poetry. And this year, I’m working with Costa* to bring you all the info and reviews in the Children’s Book category! Awesome blog moment: achieved. Last week, the 2017 Shortlist was announced and I’m super excited – there are some awesome titles included. Read on for a snapshot of the books in each category! An exploration of the Luvale tribe rites of passage, underpinned by a love of music, language and literature with a focus on race, identity and masculinity. A collection of poems concerned with the border between the living and the dead, the human world and the underworld. Morrissey revisits some of the greatest feats of human engineering to expose the balance and imbalance that has shaped our history. An insight into flora and fauna and how they are depicted in both the natural and human history and folklore through a wholly contemporary lens – ants through social media! A teenage girl holidaying in the hills of England goes missing. As the search develops, so does everyday life, full of births, deaths, secrets and betrayals. Returning to the Arctic Circle years after her first visit on her father’s whaling ship, Flora Mackie heads up her own exhibition through not only the frozen seas but love and tension with devastating results. After spending years raising her siblings after her mother’s death, Isma is finally studying in America, but not without thoughts of her brother and sister plaguing her worries. After meeting a powerful British Muslim politician, the two families’ become devastatingly entwined. Ellis and Michael are inseparable. Once they become men, Annie walks into their lives. And everything, and nothing, changes. In Summer 1923, orphan Lucy climbs into the back of an old army trucks and is whisked away to meet the Scarecrow, the Tin Man, Toto and the Lion. After the encounters with the strange men come to an end, Lucy leaves home in search of a bright new tomorrow… if she survives the hazardous path. The house on Montpelier Parade is only across town, but might as well be in another world. Casting off his lonely life, Sonny falls in love with Vera. But Vera is hiding a secret. Eleanor leads a simple life, wearing the same clothes every day, eating the same meals and buying the same alcohol. She doesn’t miss a thing. Except, sometimes, everything. One simple act of kindness shatters Eleanor’s carefully timetabled life, and she must learn to navigate anew. In 1920s London, after the shock of the First World War, newly married couple Henry and Ruby Twist have a baby on the way. But when Ruby is killed in a tragic accident not long after, Henry is left to raise his daughter alone in a world without single fathers. After a chance meeting with a stranger who seems all too familiar, Henry could find a life to replace the one he lost when Ruby died. Joe’s brother Ed is on Death Row, and the two haven’t seen each other for ten years. Ed’s execution day has been set, and this might be the last summer the two have together. You’re an almost eleven year old called Fidge, who has been hurled into a strange, new world. With three companions, including your awful cousin Graham, you have to solve a series of nearly impossible clues, a cruel dictator and three thousand Wimbley Woos. And it’s all your fault. Ami and her sick mother live on an island surrounded by sea as blue as the sky. The arrival of government official Mr Zamora brings a policy that changes everyhing: her island will become a colony for lepers. After being banished to an orphanage, Ami makes a friend and together they will find a way back home to the island at the end of everything. After crashing hundreds of miles away from civilisation in the Amazon, Fred, Con, Lila and Max are alone with no food, water or chance of being rescued. As they get to know their surroundings, it appears that somebody has been there before them. Could there be a way out? Once Upon a Time explores Xiaolu Guo’s life, from being handed over to a peasant couple in the mountains at birth, living with her illiterate grandparents in a shack at age 2 to attending film school in a rapidly changing Beijing as she navigates Western boyfriends and censorship. Mussolini was ruthless, managing men who would commit terrible crimes on his behalf. After horror spread across Italy, one family developed a bold and uncompromising resistance: the Rosselli’s. Moorehead has spent time with the surviving members of the family to reveal one driven by loyalty, duty and courage, and the human cost of the horrors that befell Italy. As Rebecca Stott’s father lay dying, he begged her to help him write a memoir: the story of their family who for generations had all been members of a Christian sect. The Exclusive Brethren were a closed community who believed the world is ruled by Satan. Rebecca, born into the Brethren, and she was always asking dangerous questions. Upon his grandfather’s death, Steve Westaby vowed to become a heart surgeon. As one of the world’s most eminent surgeons, Westaby shares the stories of the lives he has fought to save, as he took chances and pushed boundaries over a 35 year career. So there we have it: The Costa Book Awards Shortlist for 2017. How amazing do these sound? There’s definitely something for everybody here. The winners of each category will be announced on the 2nd January 2018, with the Book of the Year winner announced at the awards ceremony on 30th January. Over the next couple of months, I’ll be reviewing each book in the Children’s category, as well as choosing my own personal winner! I’m so excited for these books and the awards – I hope you are too! Do any of these books take your fancy? * This is part of a series of posts sponsored by the Costa Book Awards but all opinions and words, aside from synopses, are my own.